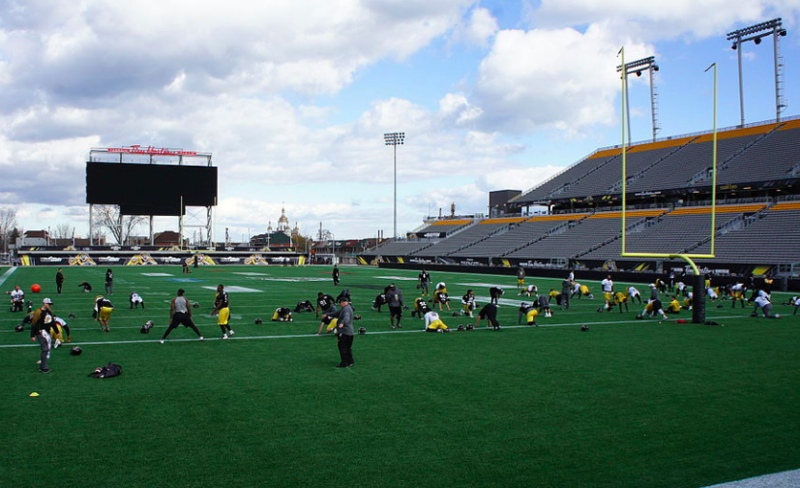 Tim Hortons Field in Hamilton is the blueprint for what Maritime Football wants to build in Halifax. The city’s CAO says Halifax won’t be taking on any financial risk to help pay for a proposed $190-million CFL stadium. The consortium behind the plan, however, has a different view. City council unanimously voted Tuesday to prepare a business case analysis for Maritime Football Limited Partnership’s dream to build a stadium at Shannon Park. The city will also work with the province to figure out potential funding options for the potential 24,000-seat structure, which would be the home field for a CFL expansion team that’s due to be announced next month. Maritime Football would own the team, the stadium and—most importantly—the debt, according to chief administrative officer Jacques Dubé. City hall would only step in with some debt repayment support but wouldn’t be acting as a guarantor on any loans. No capital costs for construction. No ongoing maintenance or operational expenses. No risk at all, Dubé promised council. But MFLP partner Anthony LeBlanc says his group will need the government “involved at the table in some fashion” in order to put together the stadium’s financing structure. “The conversation about how the money will flow, who will sign up for it, those are to be determined,” LeBlanc told reporters after the meeting. The former president of the Arizona Coyotes stressed that Maritime Football will take on the $3 million a year in operational risks from running the stadium. Only the operational risk, he was quick to clarify. Not the financing risk. LeBlanc wouldn’t say whether he wants the province or the city to guarantee his company’s loans for the stadium or whether MFLP would be looking to borrow money under the province’s generous financing rates. About the only thing he was certain of was that the public was going to have to take on some level of risk if it wants a CFL stadium in Halifax. The municipality thinks it can support the proposal through Tax Increment Financing. Property taxes from the stadium and nearby commercial development would be set aside to pay the debt payments, which staff estimate will work out to $9 or $10 million annually. It’s also unclear whether the TIF would cover just the 20 acres of stadium land and ancillary buildings or if it would be applied to the entire 90 acres of Shannon Park up for redevelopment. Both options seem to be on the table, despite the latter completely upending residential redevelopment plans already assembled from multiple public engagement sessions. “If it includes the entire site, there’s no way I could vote for that,” warned Dartmouth Centre councillor Sam Austin. Even though many of the specifics remain unspoken, Dubé did tell council during Tuesday’s meetings that he expects revenue from the TIF to equal about $5 or $6 million annually. The remainder would potentially have to be made up from the province, with staff suggesting increased hotel room levies and a new car rental tax. City solicitor John Traves says Dubé’s estimate isn’t based on anything specific other than the $190-million projected cost for the stadium from MFLP. “We’ve had some discussions that we’re not able to talk about yet which would give us an idea of what else would they build that they wouldn’t build otherwise if not for the stadium,” Traves told reporters. Maritime Football, working with real estate developers Jones Lang Lasalle in Atlanta and Gensler Architects in Los Angeles, is basing its estimated $190-million construction cost off of the $145-million price tag for Tim Hortons Field in Hamilton, plus some inflation. Hamilton’s stadium opened late and unfinished in 2015 and has since cost that city $2.5 million in repairs for everything from persistent leaks and unsafe railings to missing draft beer lines and rain-damaged television screens. Staff will now go off and put together a detailed report on MFLP’s proposal, including other costs for the municipality to build up roads, sewer and transit infrastructure around a new stadium district. It’s estimated the business case analysis won’t return to council for at least six months. In the interim, Maritime Football will be lobbying HRM and provincial officials about finance options while continuing negotiations about purchasing the property from Canada Lands Corporation. A season ticket drive and team name will be announced next month to test how willing HRM is to play out its football fantasy. Excitement for Halifax’s potential CFL team comes as the football league plays offence against player safety. Maritime Football says 5,000 deposits have been made towards its fantasy football team, but won't say how many buyers that number represents. “Very credible” proposal for new Halifax CFL team dredges up old ideas. What’s the future hold for Shannon Park? Talks with CFL commissioner Mark Cohon about bringing an expansion team to Halifax. How Halifax’s big dreams have become a nightmare, and what needs to happen to make the city a great place to live.